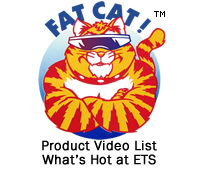 Video, Audio and Data products: from converters to baluns, Energy Transformation Systems (ETS) offers the best quality products, the most advanced designs, at highly competitive prices. Please use the menus on the top or bottom of every page to locate a focused set of product pages, contact information, and purchasing channels. Since 1980, millions of terminal devices have been connected with ETS coax and twisted-pair data communications components. As a pioneer in solutions for networking connectivity problems, ETS recognizes that the solution for many of today's connectivity problems involve products and approaches that may not be listed or shown in our catalog. ETS takes great pride in working with our customers to develop custom engineered products and solutions for specific needs. From our headquarters in Fremont, California, we supply products worldwide, including Canada, Europe, Asia, Australia, and Central and South America. Take advantage of our technical expertise by contacting us about your connectivity problems. Energy Transformation Systems, Inc. is a pioneer in the design and manufacture of physical layer components, including baluns and adapters for network systems that enable audio/video and Ethernet devices to operate over various media not envisioned during systems design, especially in the case of unshielded twisted-pair (UTP) wiring. ETS product solutions significantly reduce the cost and complexity of connecting, modifying, and maintaining LANs. Since 1980, millions of terminal devices have been connected with ETS coax and twisted-pair baluns. ETS products are manufactured with lead-free solder and are RoHS compliant. ETS is qualified as a "green" company. In the area of multimedia connectivity, ETS provides the highest-quality products for audio and video signal transport over a variety of media, including digital and analog line-level audio, baseband or broadband video and from HD-SDI digital video to analog RGB; and VGA. All products are 100% tested and guaranteed. Energy Transformation Systems, Inc. is a manufacturer and supplier of high-performance audio and video connectivity devices, data communications wiring products, and physical layer LAN products. We are pioneers in physical layer components for network systems that enable Ethernet, Token Ring, AppleTalk/Local Talk, IBM and Wang devices to operate over media not anticipated during system design, especially unshielded twisted-pair wiring. We supply product solutions that significantly reduce the cost and complexity of connecting, modifying and maintaining LANs. ETS designs, manufactures, and markets electronic devices that aid in conducting signals and maintaining signal integrity over Cat5, coaxial, twisted pair, and similar cables. These ETS solutions are installed in broadcast facilities, Broadway theaters, corporate offices, government and military installations, shopping malls, educational institutions, healthcare facilities "smart" homes, worship centers, meeting halls, outdoor displays, hotels, airports, train stations, public transportation systems, and tradeshow displays, to name just a few. Based in Fremont, CA, Energy Transformation Systems, Inc. (ETS) was established in 1967. ETS is a manufacturer/supplier of high performance analog/digital audio/video/data media conversion and structured wiring products, as well as custom patch panels. Our mission at Energy Transformation Systems, Inc. is to design, manufacture and market multimedia and data network products. We take pride in consistently satisfying our customer's needs. Our goal is to profitably provide technically excellent devices, built to specifications, and on time. Our responsibility is to supply quality products that enable our customers to carry out their mission plans. Trudy Andresen has been CEO of ETS since May 2006, replacing her husband Jack after his passing.